A serial killer is burning people alive in the Lake District’s prehistoric stone circles. He leaves no clues and the police are helpless. When his name is found carved into the charred remains of the third victim, disgraced detective Washington Poe is brought back from suspension and into an investigation he wants no part of . . .
Washington Poe was the Detective Inspector of the National Crime Agency (NCA) until a mistake saw him put on suspension whilst an investigation began into his conduct. He headed home to Cumbria and bought a small house in the middle of a field with no neighbours. He was happily leading a quiet life with just himself and his dog Edgar for company. That was until acting Detective Inspector Stephanie Flynn showed up with an Osman warning (a police warning that his life was in danger) regarding a serious case that was ongoing. She also wanted Poe’s help with the case so offered him the job as Detective Sergeant until the case was solved. The case in hand was that there had been multiple men found tortured, their private parts had been removed and then they had been burned to death in stone circles around Cumbria. The latest body, number three, had also been found with something cut into his skin – the words Washington Poe and what looked like the number five. Giving the reason for the police believing that Poe was in danger and the targets fifth victim. With a target on his head, Poe has to return to work and help solve the case before he becomes a victim. But Poe isn’t a man who follows the rule book and it’s not long before he finds himself following his gut rather than the evidence, much to the annoyance of DI Flynn and her bosses. If there is one man you want on your team to find the sadistic killer it’s Poe, but can he find the killer before losing his job, again? 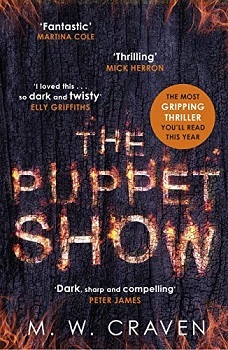 The Puppet Show is a perfect executed crime thriller following the police, especially Poe and Criminal Analyst Tilly Bradshaw as they work closely together to uncover the ‘Immolation Man’, what the papers have dubbed the serial killer. The book took a different route to what I was expecting. I was expecting the book to be one that would keep me awake at night having nightmares, hence when I began the book I did so during the day opting for something different to read the night before. However, the book is more about Poe and his team trying to find the killer and less about the killer him/herself. This type of book is perfect for me as I love police procedural novels. Poe is an aging detective who has been on the job long enough to know that you can’t always follow the paper trail, sometimes you have to do what you think is right and if that means having to make a few tough decisions that go against his bosses then so be it. He knows it could backfire on him. He also knows that nine out of ten times his hunches are right. Tilly is an absolutely remarkable character. From the description of her and her actions, you get the feeling that she has Asperger’s. She is exceptionally clever and talented but doesn’t understand humour, emotions and takes everything that people say to her literally. I have a teenage son with this condition so I could understand Tilly perfectly. You can’t help smiling at the girl as she comes more and more out of her shell and is vital to the investigation. The book had me engrossed from the very beginning. M. W. Craven’s writing has a natural flow to it and he knows how to write superb characters that have their flaws but are exceptionally likeable and intriguing to read about. They are also perfectly realistic. He also knows how to send you up the wrong path with his many twists and turns, definitely keeping you on your toes. As serial killer/detective books go, this has to be in my opinion one of the best. As the killer’s victims mount up you start to wonder how is this person ever going to be stopped and how are they choosing their next victim as everything seems to be very calculated and they certainly know the Cumbria area in detail as nothing is left to chance. As Poe starts to close in the tempo of the book seemed to pick up and I did feel like I was sat on the edge of my seat at times. I now can’t wait to see where M. W. Craven takes Washington Poe next in the series and I do hope that Tilly is still by his side. If you love thrillers/crime books, you need to read this one. M. W. Craven was born in Carlisle but grew up in Newcastle, running away to join the army at the tender age of sixteen. He spent the next ten years travelling the world having fun, leaving in 1995 to complete a degree in social work with specialisms in criminology and substance misuse. Thirty-one years after leaving Cumbria, he returned to take up a probation officer position in Whitehaven, eventually working his way up to chief officer grade. Sixteen years later he took the plunge, accepted redundancy and became a full-time author. He now has entirely different motivations for trying to get inside the minds of criminals . . .
M. W. Craven is married and lives in Carlisle with his wife, Joanne. When he isn’t out with his springer spaniel, or talking nonsense in the pub, he can usually be found at punk gigs and writing festivals up and down the country. This sounds really good. I want it. It is brilliant. You should read it. I kind of burned myself out on police procedurals but this sounds really good. Also that cover is INTENSE! Wonderful review!! I think you should definitely read this one. Might ignite your love for them! I’ve seen this one all over Twitter. The cover really grabs my attention and your review has made me really want to read it. I know it is everywhere at the moment, It is so good though. This is new name for me – I wants it! I hope you get to read it. brilliant, you should read the book you’ll certainly have more!! Ooh this sounds so intriguing! Will add it to my list. Fabulous. I hope you enjoy it. I’m not usually a huge fan of crime thrillers/police fiction but this looks really good! Glad to hear the story is more about solving the crime then the heinous acts…if I had to read those in depth I would certainly have nightmares!!! This books looks like a great read for suspense/thriller fans. I know I was worried at first too. I hope you get a copy and enjoy it. The book seems like it would be for me. I’m going to purchase a copy this weekend. Thanks for your review. Brilliant, I hope you enjoy it. This is one of my buddy reads! Can’t wait to get to it! Brilliant, I hope you enjoy it as much as I did. Looks really interesting! Great review! Love that cover!! It is very interesting. Thanks. Amazing review Stacey, this one looks and sounds absolutely amazingly fantastic and right up my alley as well. Thank you so much for sharing your awesome post. Yay, I’m so happy you like it. The book is amazing.